Back training is a science. Study your back before you attack to ensure the best possible results. Read this before your next back day! Many articles on back training are geared toward people looking to rival Dorian Yates. While that's an admirable goal, the importance of building a strong back extends beyond bodybuilder aesthetics. The muscles in your back serve many functions in everyday movements, from maintaining good posture to carrying heavy objects around your home. Training your back properly will also help reduce back pain, improve overall strength, and help you maintain proper form during your workouts. Because of your back's complexity, training it can be a bit overwhelming—especially if you're a physique athlete trying to isolate each muscle. Also, because your biceps play a big part in most back exercises, it's easy to depend upon them to do the work instead of your back muscles. If you're not getting results from your back training, it's probably because you're missing out on some key aspects. And that's where I come in. Keep reading for a guide to the finer points of back training and a balanced full-body workout to help you build the back you want! Latissimus dorsi: As the largest muscle group in the back, the lats serve an array of functions. They extend, adduct, medially rotate the humerus, and raise the body upward during movements like chin-ups. Trapezius: Your traps connect the upper extremities of the vertebral column. It runs from the base of the skull, out over the scapula, and down the cervical spine. The traps elevate, retract, and rotate the scapula during exercises like shrugs, side lateral raises, and rows. Rhomboids: The rhomboids act to retract the scapula and rotate it to depress the glenoid cavity. The rhomboids also affix the scapula to the thoracic wall. Erector spinae: The erectors are a bundle of muscles and tendons that run vertically in the grooves on the side of the vertebral column. They extend and laterally flex the spine. Teres major, teres minor, and infraspinatus: These are smaller muscles located near the humeral head. They're used to adduct and medially and laterally rotate the arm. Other important muscles include the serratus anterior, deltoids, subscapularis, abdominal obliques, and the gluteus maximus. The most important aspect of back training is to learn how to activate the major muscles and use them appropriately during all lifts. 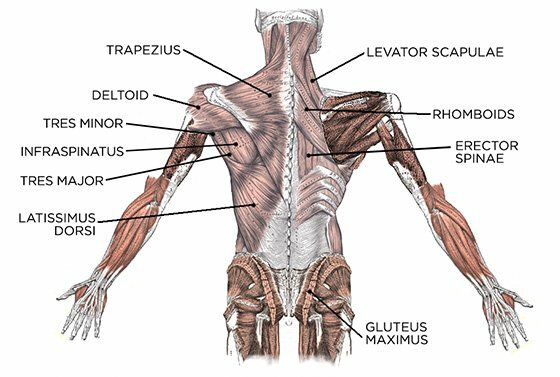 In contrast, untrained lifters can sometimes over-utilize the erector spinae and under-utilize their lats, traps, and rhomboids. Scapular protraction is often referred to as "abduction of the scapula." You can feel it when you round your shoulders forward to create thoracic flexion. The primary movers during protraction are the serratus anterior. Your pecs can act as synergists. Scapular retraction, or "adduction of the scapula," occurs when you move the scapula posteriorly and medially along the chest wall. You can achieve scapular retraction by bringing your shoulder blades together, using the rhomboids and traps as the primary movers. These two movements are antagonistic, or have opposed actions. Used together, they secure the scapula in place to provide a support (fulcrum) from which you move your arm (lever). Scapular protraction and retraction are an important part of horizontal pulling (row) movements. Beginner and even intermediate lifters often make the mistake of making the biceps the primary movers in horizontal pulling exercises. To get the most out of rowing movements, learn how to properly retract your scapula. When you set up for a row, start at the bottom of the movement in scapular protraction. Your lumbar spine should be flexed so that you feel a good stretch in your upper back muscles. The first part of your pull should be scapular retraction. Keep your arms down with slight elbow flexion, and just retract the scapula so that your shoulder blades move together. Once your scapula is abducted, focus on pulling your elbows behind you until your hands reach your ribcage just below your chest. Once you master this part of the movement, you will feel how well your back muscles work during a row. Your biceps will be working as synergists rather than primary movers. During vertical pulling exercises like pull-ups, chin-ups, lat pull-downs, your lats should be the primary movers. Many lifters, beginner or otherwise, overcompensate for poor lat activation by over-using the biceps during vertical pulls. Generally, this lack of lat activation occurs because the lifter doesn't know how to use his or her lats properly during a vertical pull, or because he or she is trying to use too much weight. To learn how to activate your lats during pull-ups and pull-downs, try this exercise: Hang from a pull-up bar so your arms are fully extended over head. Get a good stretch in your traps and your erector spinae. Keeping your arms completely straight, pull your shoulders down so your lats contract. Avoid shrugging your shoulders up by your ears—nothing else should move except your upper back muscles. Rather than feeling your scapula squeeze together, you should feel it moving downward. Return to starting position (dead hang) and repeat. This exercise mimics the beginning of your vertical pulling movement. It should begin your pull-ups, chin-ups, and lat pull-downs. Once you engage your lats in that initial movement, focus on moving your elbows back behind you. As you bring your sternum to the bar or the bar to your sternum, you should feel your lats contract and your pectoral muscles stretch. As you pull your elbows behind you to move your body toward the top of the movement, it's important keep your core engaged to prevent lumbar hyperextension (arching your low back). Use your abdominals, obliques, and erector spinae to stabilize your spine in neutral position. One of the largest mistakes made during an upper-body pulling exercise is the actual act of pulling. I know, it sounds ridiculous, but bear with me. When you try to pull the weight toward you, your mind will first focus on your biceps. But if you rely on your biceps, you'll completely remove your back from the exercise. To prevent yourself from doing this, try to take your hands out of the equation. I mean, don't cut them off or anything, but rather than using your hands and forearms to pull the load, think of them as hooks that connect your elbows to the weight. For a mental picture, think of a forklift. The forks hold the weight, but the truck relies on the tilt cylinders, and mast to lift and lower the load. Your hands hold the weight, your back muscles are doing the actual work. A good back workout will involve horizontal pulls, vertical pulls, and deadlifts. An important part of structuring your weekly workouts is balancing your pushing and pulling movements. (I addressed this in my previous article). If you do a typical five-day body part split, you may notice that your weekly workout has far more pushing than pulling exercises. The workout split that includes a day for chest, a day for shoulders, and a day for back, has you pushing twice as much as you are pulling. Not only is this bad for symmetry, it's probably the reason your shoulders hurt. Divide your week into two- or four-day splits. Make sure that your push and pull movements are balanced. Perform these full-body workouts on alternating days. They are push/pull balanced and will help you build that back you've been working toward.